A shadow is temporary – fleeting - here for a moment, then gone for ever. A shadow cannot exist unless there is light and substance, and yet of itself is the absence of total light. 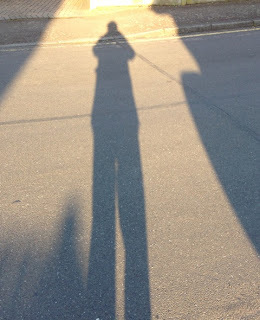 A shadow cannot be sensed unless there is a sensor, and for there to be a sensor there must be intelligence. Man is like a shadow – here for a moment, then gone for ever. He cannot exist without light and substance, and of himself he has partial light. Unlike a shadow he has intelligence and life. In his brief moment he glimpses the shadow and knows there is light. Without light there is no life and there are no shadows; there is nothing but darkness and death. Light is energy and eternal and without light nothing can exist. Light overcomes darkness and brings life. John 1:1-5 ‘In the beginning was the Word, and the Word was with God, and the Word was God. He was in the beginning with God. 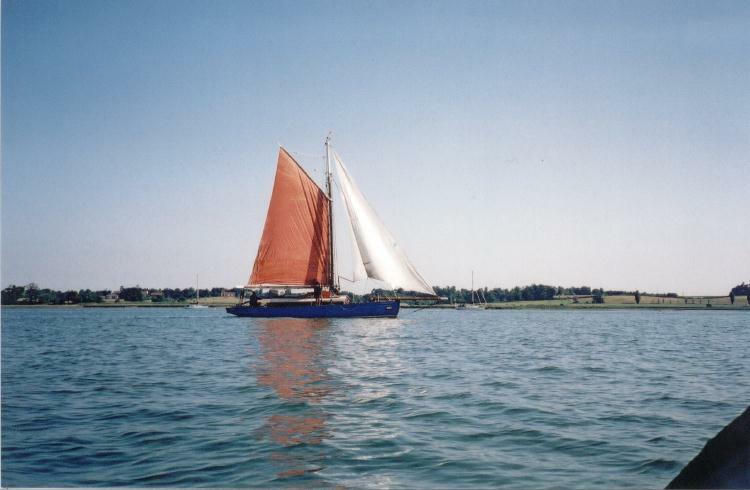 A gaff cutter is a fore and aft sailing vessel that has one mast, and a gaff that supports the mainsail. She has two or more foresails: typically a staysail, jib and perhaps a flying jib. A good many gaff cutters have bowsprits, particularly older classic yachts. 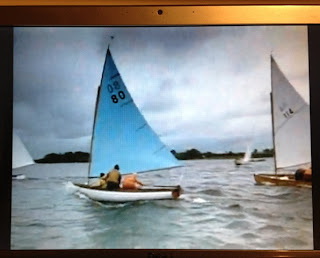 The photos here are of gaff cutters that I’ve featured in five previous postings. (See links below.) 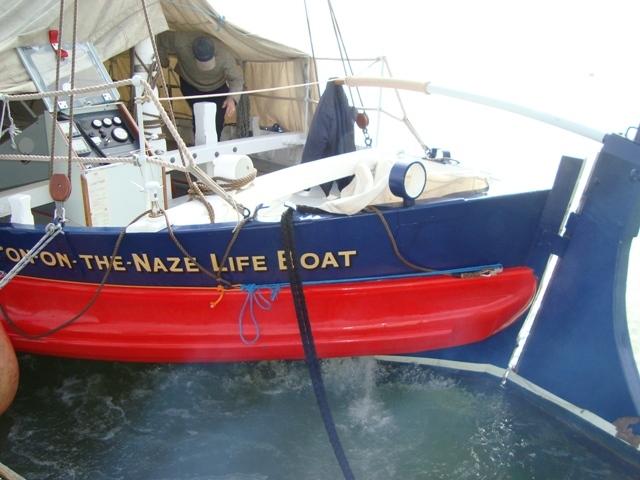 Four more links take you to brokers’ web sites where gaff cutters are for sale. The main advantage of a gaff cutter is the ease with which she can be made to sail herself, especially to windward. 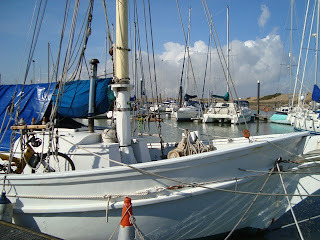 The natural tendency for a boat when sailing to windward is to luff into the wind. 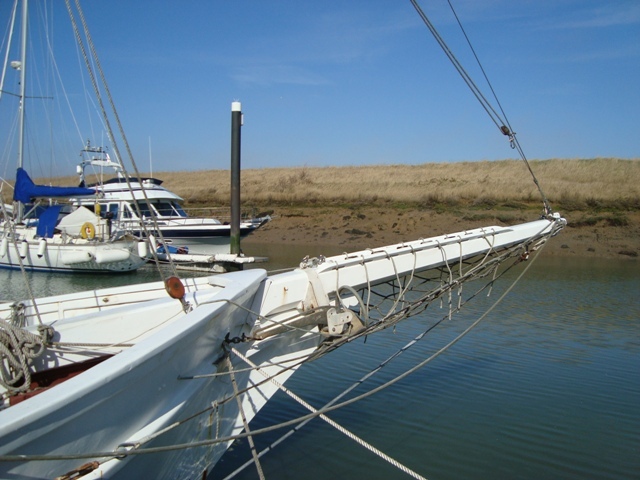 By slightly backing the jib and easing the mainsail, the helm can be neutralized so that the boat will steer herself, but it’s a good idea to attach bungees to the tiller to help maintain a course. 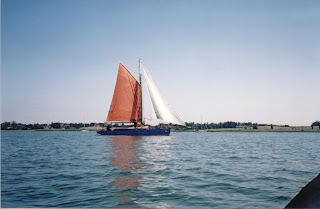 If she bears off, increased wind pressure on the mainsail will push her stern to leeward, bringing the boat back on course; if she edges too far into the wind, the backed jib will push the bow to leeward; thus the boat will weave to windward. Obviously, this is not the most efficient way to sail, but it does give the helmsman a break. In fact, if the wind is steady and the sea state doesn’t unduly change, the yacht will sail for hundreds of miles in this fashion. Yesterday morning Ray Clark and his team at BBC Essex, during the Breakfast Show, joked about potholes on the County’s roads. 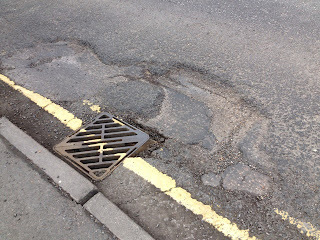 In fact, it’s not really a matter to be taken lightly, because lives could be at risk, particularly those of cyclists who may have to dodge potholes and find themselves in the path of a motor vehicle. With hilarity and banter to fill in time, the breakfast presenters discussed a real life game they had devised which involved avoiding potholes when driving to work. They couldn’t make up their minds what to call the game, but came up with four possible names: Car Bingo, Tyre Bagatelle, Pothole Bingo and Dodge the Pothole. I got the impression they favoured the last, which is the most descriptive. The idea of the game is to get to work with an intact score of 10. In other words if ‘players’ manage to avoid every pothole by dodging them, they arrive at work with full marks. 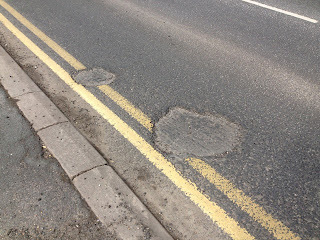 If they clip a pothole they lose ½ a point; if they go over a ‘standard’ pothole they have to dock a full point; if they are unfortunate enough to clash with a ‘wincer’ (a large pothole) they forfeit 2 points, and finally if they blunder into a ‘shredder’ (an enormous pothole) they suffer a loss of 3 points! I’ve got a feeling they will suffer more than that, as I did this morning when driving my car home after shopping. There were twin potholes just before a turning off the main road. Fortunately, I had slowed down on making my approach to the turning; otherwise there could have been damage to the springs of the car. Certainly, I felt judders as my car’s tyres failed to absorb the impacts. A half-an-hour later when I walked the footpath by the twin potholes I observed a road maintenance man was measuring the depth of the holes. Someone had obvious reported the situation. I can only hope that repairs to the road will speedily be done. I was perusing Paul Mullings’s blog, ‘I’ve Been Thinking’ at http://flounderman.blogspot.co.uk/?view=timeslide#!/ when I noticed a link pointing to ‘Shannon One Design’. 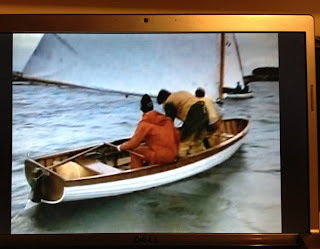 This took me to a YouTube series of videos about the building of a traditional clinker Shannon One Design racing dinghy. (See the first 3 links below.) 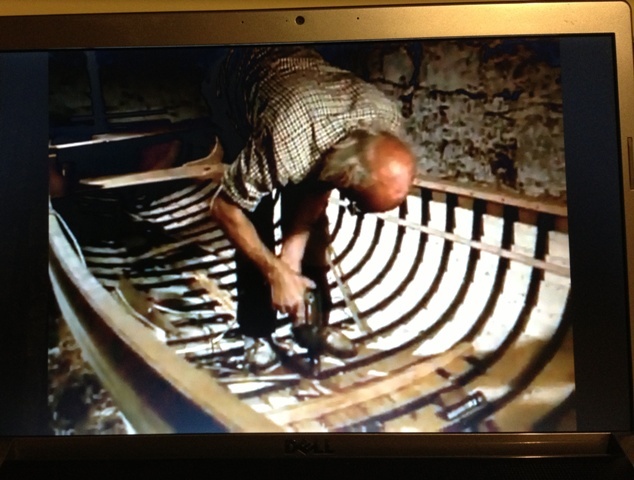 The videos show Jimmy Furey building one of these boats. I think you will agree with me that it is a privilege to be invited into his workshop via the videos entirely free of charge. I also think you will admire his craftsmanship, which is a wonder to behold. 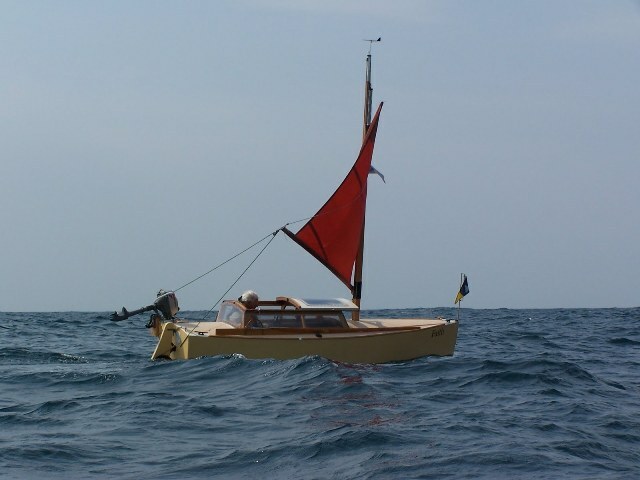 Back in 1920 F. Morgan Giles of Teignmouth was commissioned by representatives of three Irish yacht clubs, Loch Ree, Loch Derg and North Shannon, to design a one design racing dinghy suitable for a crew of three. 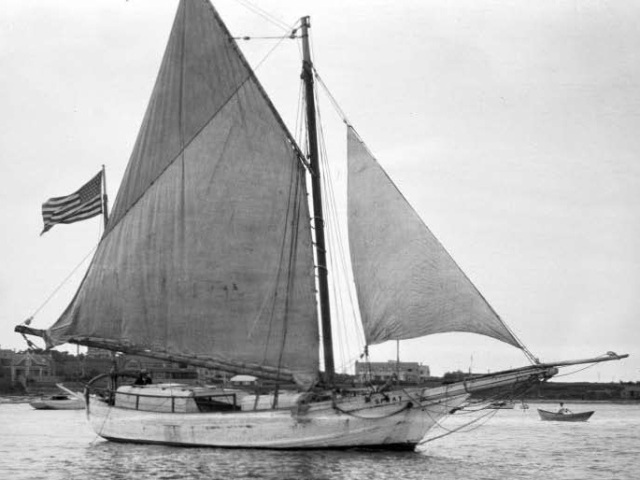 The result was a lively 18 foot open clinker boat with a relatively narrow beam of 4 feet 10 ½ inches, sporting a single gunter-rigged sail with an area of 140 square feet. 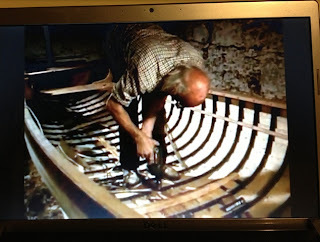 Over the years, nearly 170 of these dinghies have been built, and they continue to be built today by local craftsmen such as Jimmy Furey. On 3rd February, 2013 I wrote an article about Roger Taylor’s, ‘Mingming’. I included three links to Amazon.co.uk giving details of three of his books. What I didn’t mention was that they are also available for Kindles. If you don’t have a Kindle, you can download a Kindle App free of charge from Amazon, suitable for your computer or your iPhone or an equivalent smartphone. 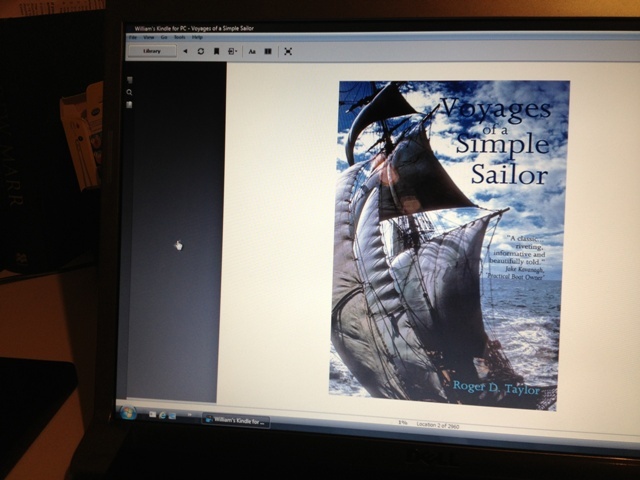 Last week I handled a paperback version of Roger’s ‘Voyages of a Simple Sailor’ and immediately I wanted my own. Being a cheapskate I looked at Amazon where I discovered I could get it for less in e-book format for my Kindle - not a lot less I grant you, but it was immediately available for my own gratification. Now that I have read the Kindle version I wished I had paid the extra for the paperback! Handling a book is so much better than simply seeing words on a computer screen. If you buy your own copy you’ll be getting three books in one, because it is divided into three stories: Shipwreck, Capsize and Calms. I won’t spoil it by making a précis of each story, but if you are into sailing and cruising I thoroughly recommend you treat yourself to a good read. Most reviewers gave the book five out of five! Hence, you can be guaranteed you won’t be disappointed. I was hooked from the moment I started reading the Preface. Having experienced sailing small junk-rigged boats I could readily understand Roger’s enthusiasm for ‘Mingming’. 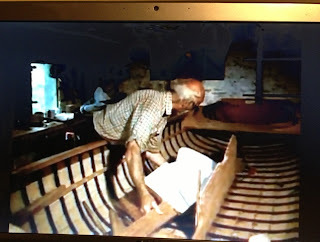 Here I’ve assembled a number of links that will take you to accounts of some of the cruises I’ve done with my own boats and with others. To follow each log, first visit the starting page, and from there you can see links on the right hand side. Before leaving this page make it one of your favourites, or bookmark it as the case may be. That will ensure you’ll be able to find it again. Pottering – Part 1 (A South Coast Cruise with 'Sandpiper', my West Wight Potter. According to my dictionary, alacrity is a cheerful readiness, promptness or willingness, and that sums up the essential character of my friend’s boat which is a 19’ Alacrity. I met her for the first time last Monday when he proudly introduced her me. She was snugly settled in the mud by Walton Yacht Club, tethered to four mooring lines. As I looked at her she reminded me of a faithful cocker spaniel waiting for her owner to take her for an adventure. 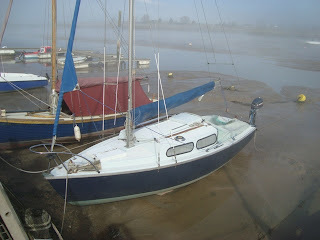 Essentially, she’s a day sailer, come small coastal cruiser for a crew of two. She actually has three berths, but I feel she would be crowded when cruising with a complement of three. 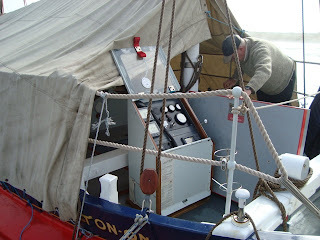 Nice touches are her furling headsail, slab reefing main, twin backstays and mast tabernacle. 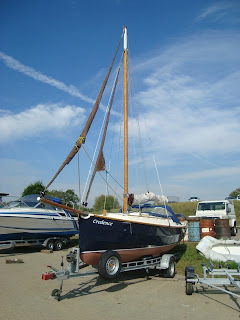 She has two Tufnell winches mounted on the coamings for working the foresail. 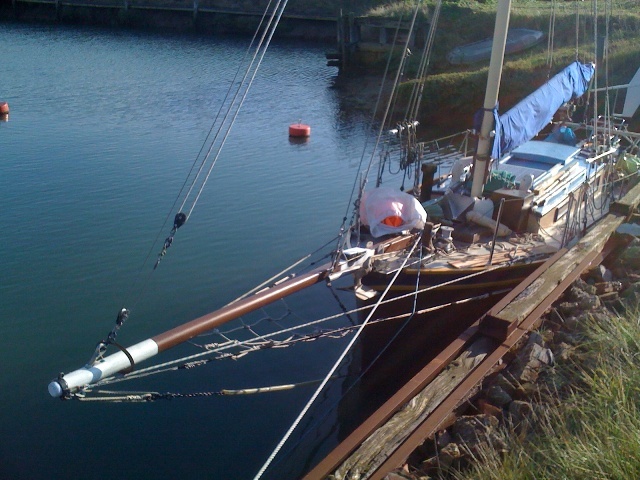 She has the security of a pulpit and sensible anchor stowage on the foredeck for easy deployment. Two cabin top ventilators provide fresh air for the crew when they are down below. 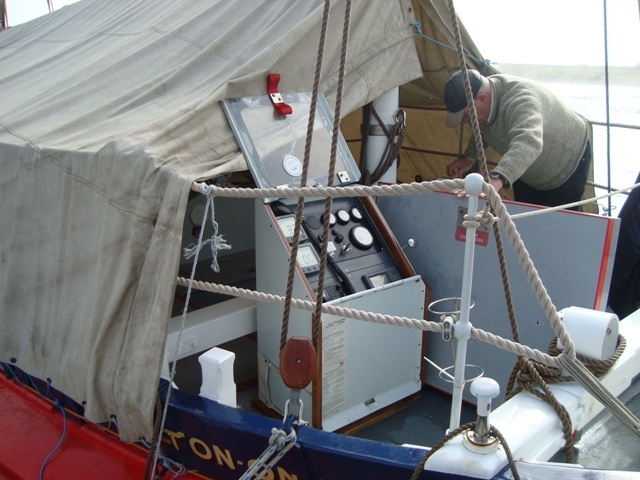 A twin butane stove mounted almost amidships on the port side is handy for cooking and for making hot drinks. 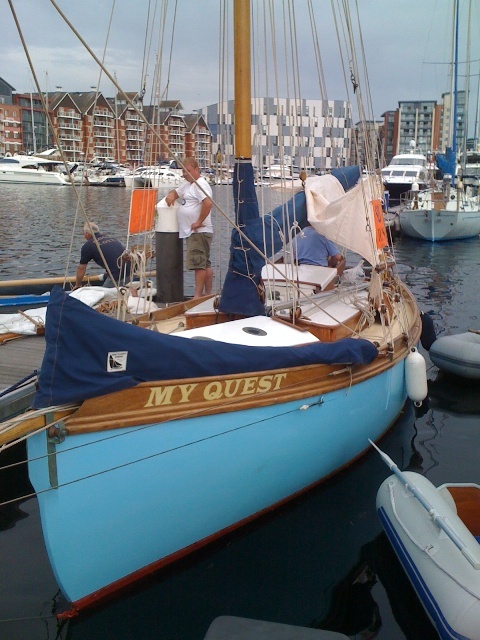 I’ve been invited for a sail on the Alacrity, and no doubt when I get back from my forthcoming cruise with ‘Sandpiper’, my ‘C’ Type West Wight Potter, I’ll be able to sample the delights of my friend’s boat. 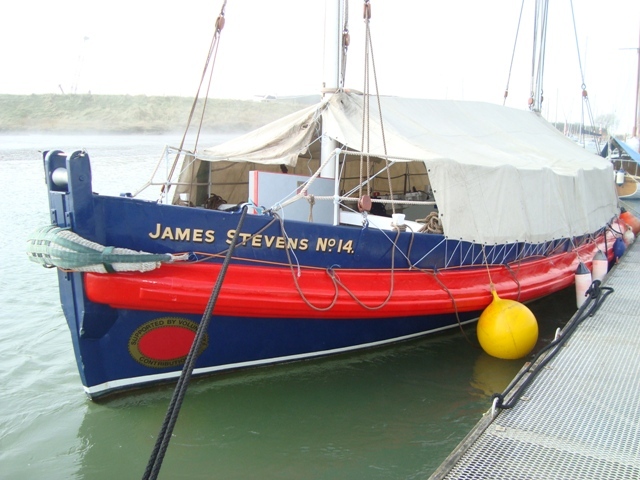 You can find a very good summary of the history of the ‘James Stevens No 14’ lifeboat by clicking the second link below. 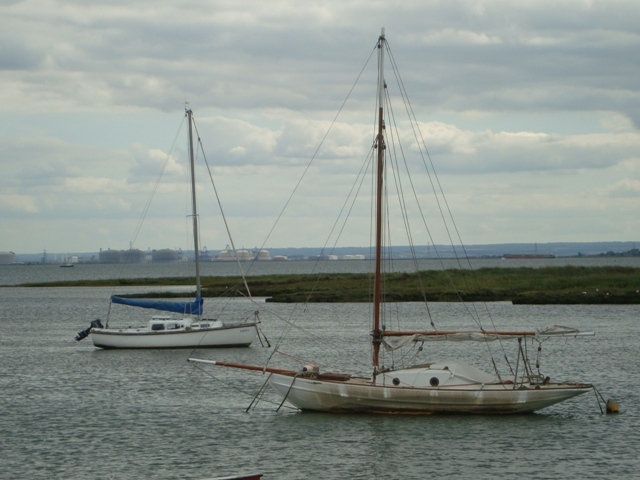 This historic lifeboat designed in 1807 started life as a pulling and sailing vessel, but in 1906 she was fitted with a 40 hp Blake petrol engine. She is the oldest surviving lifeboat in the world to have been powered by an engine. At 42.98’ LOA she would have been more than a handful to row. I have previously featured* this Spray Class Yawl. This time I have close-up detailed photographs. She appears to be a fairly accurate replica of Joshua Slocum’s original 36’ 9” wooden gaff yawl, except she is a Ferro cement boat. 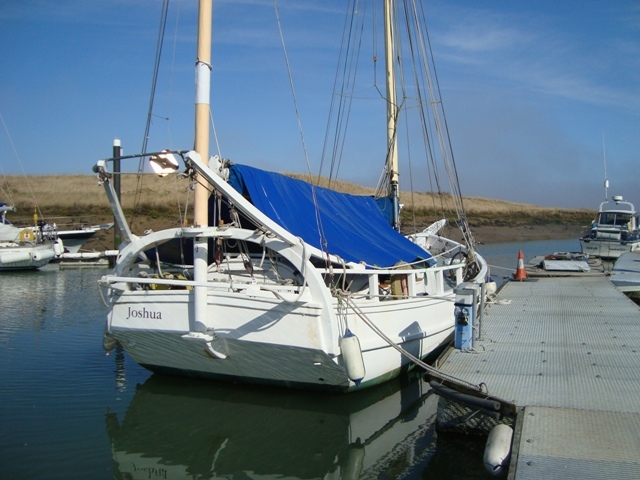 Her deckhouse structure is similar to the original, but she has a little less freeboard. Her solid construction and heavy displacement should give her crew an easy motion at sea. 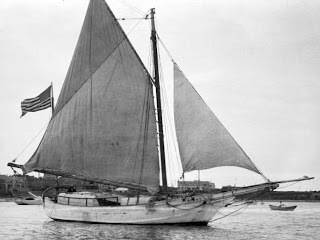 I would be interested to learn if she can do as Slocum’s ‘Spray’ did, that is to sail for hundreds of miles with her helm lashed. For some reason I have an obsession with this very unusual one-off junk-rigged yacht. Two days ago I saw her again; this time she was out of the water so that I could see her underwater lines. 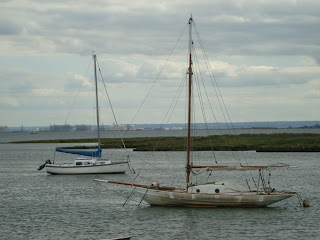 They were very much as I had imagined when first seeing the boat afloat, i.e., she has a deep, long keel and firm bilges. Had she been beamier, she would have been less tippy, and had she had a wide transom, that also would have helped reduce her tendency to roll, particularly when on the run. You might say, “How do you know this without sailing her?” I’ve sailed boats since the age of 13, and I’m in my late seventies; therefore I have a pretty good idea as to how she will perform. 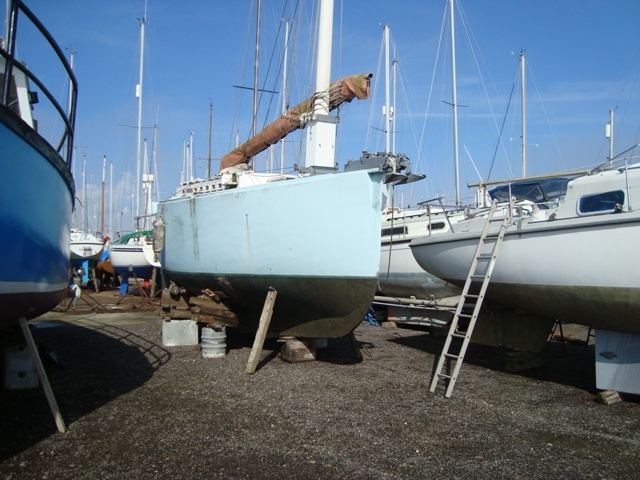 She will be a beastly pig of a boat! 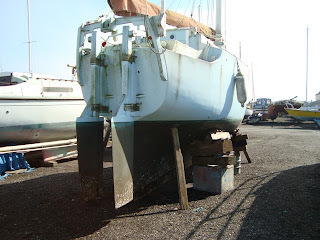 She has the unfortunate feature of very high, slab-sided topsides. These raise the centre of gravity, making her less stable than a boat with lower topsides. 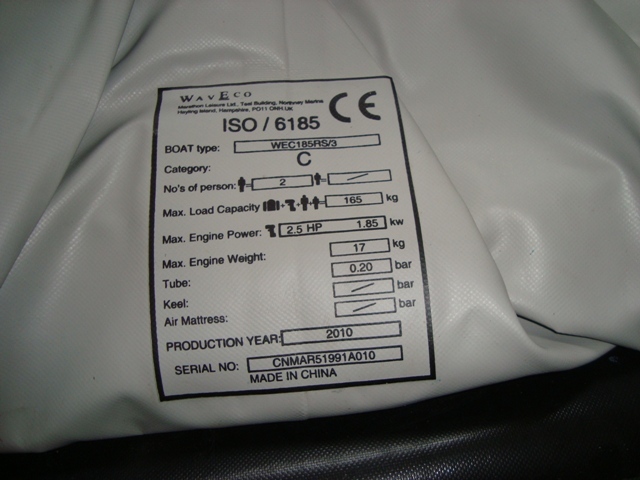 High topsides also increase windage. 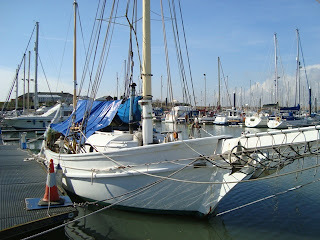 Hence, with no sail set, the sides of the yacht will act as if they were sails. Because of this she will range on her mooring or anchor warp. 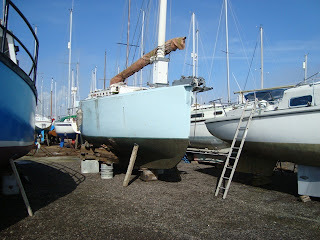 Her heavy mast will contribute to a pendulum motion, particularly when she is at anchor, and undoubtedly this will be aided by her internal ballast which is mainly set at the waterline. 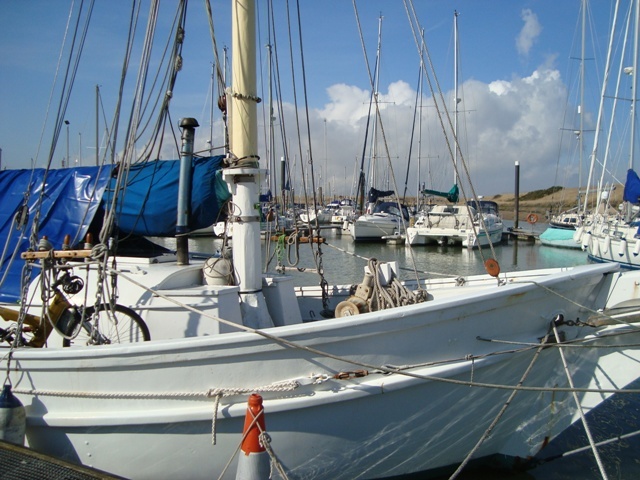 She doesn’t have an engine; therefore she relies on a yuloh for manoeuvring within a marina and for propulsion when there is no wind. Exactly where one attaches the yuloh to the stern of the yacht is a mystery. There is no provision for a rowlock or a universal joint mechanism for locating the shaft of her yuloh or sculling oar. Her rudders are a pain. They are held in place by rope lashings which are inadequate for supporting them. 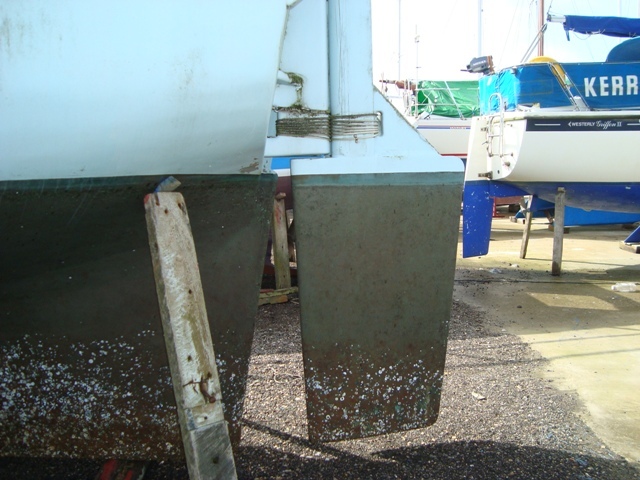 If she had been a beamy light displacement yacht there would have been some merit in having twin rudders. The only possible advantage with the present setup is that if one is lost, there is another with which to steer the yacht. I have said some pretty uncomplimentary things about this unique vessel, and yet she continues to lurk in my mind as a creature with which I have an obsession. If only I could dismiss thoughts about her, life would be more comfortable. She’s a bit like one of those black spots that float around in ones vision; wherever you look to avoid seeing the spot, you just cannot get rid of it! 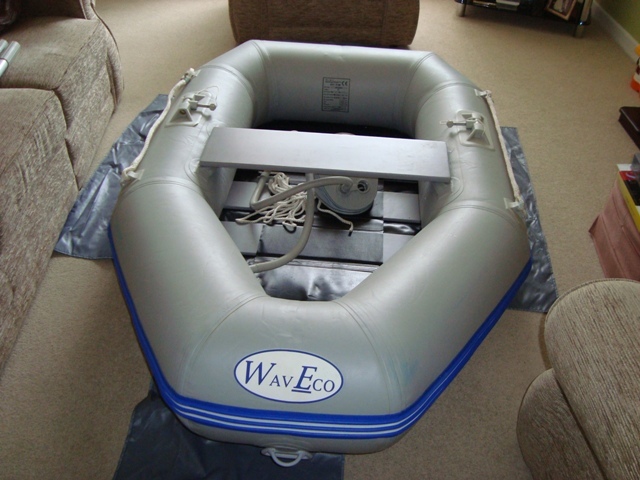 Now that I have a smaller boat I no longer have a use for my WavEco 7 foot inflatable dinghy. 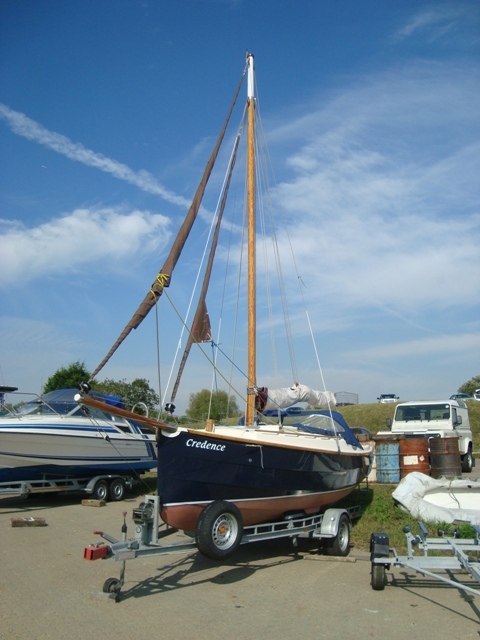 My ‘C’ Type West Wight Potter is no bigger than many sailing dinghies; therefore she can be treated as such, which means I can beach her if need be for getting ashore. 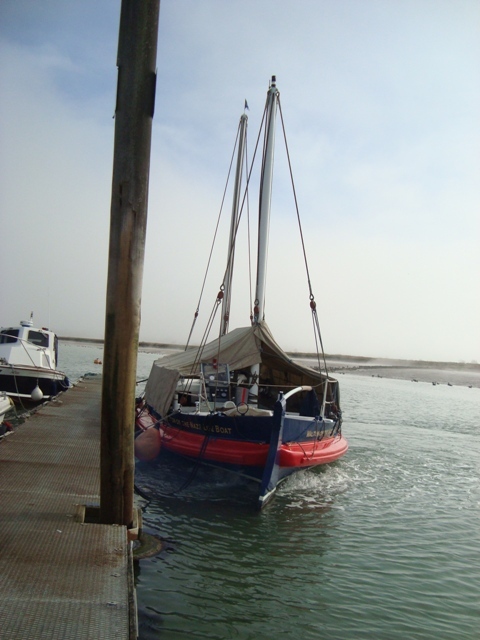 On the other hand, there may be a few occasions when it may be better to leave her at anchor or on a mooring. To meet those situations I shall look around for a smaller alternative inflatable dinghy or canoe. Meanwhile there is no point in keeping my WavEco in the house loft – far better to sell her and let her be useful to another person. To that end I have put her up for auction at Ebay.co.uk. 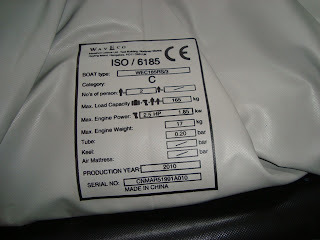 Key in the following number into the Ebay search box: 160993298020. For more information, also have a look at previous articles I’ve written about my WavEco by clicking the links below. 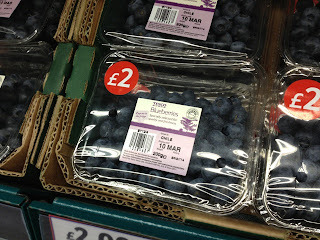 Today I am ranting about TESCO’s sourcing of fruit and vegetables. Yes, from a health point of view it’s great to eat ‘five-a-day’, but at what cost to the environment? I love eating fruit, and I find it hard to resist what is on offer at my local TESCO. 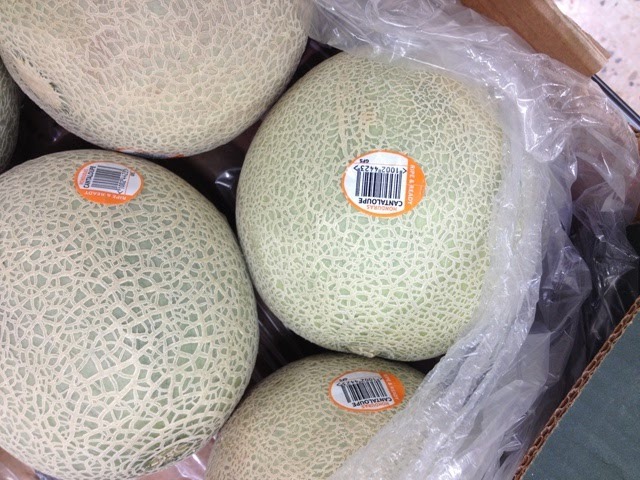 If fruit from faraway countries was not on their shelves I would not have a choice whether to buy it or not. 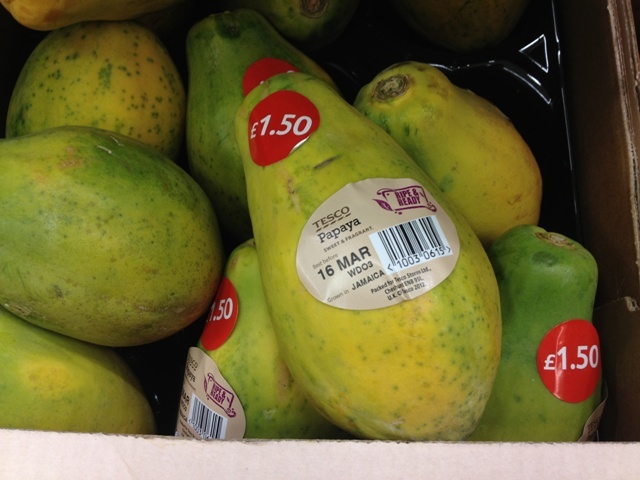 One thing is sure, people in the UK are buying fruit and vegetables grown in countries such as Ecuador, Honduras, Jamaica, Chile, Brazil, South Africa, Morocco and a little closer to home, Spain. 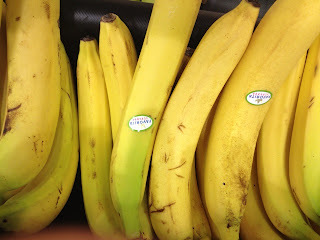 Mostly, these fruits and vegetables are transported by plane, the exception being bananas which are mainly shipped as frozen cargo aboard vessels designed for that purpose. Years ago we did not have this option of buying fruit out of season. If we wanted to eat apples during the winter or spring we had to harvest them in the autumn of the previous year, wrap them in newspaper and put them in the loft where they would remain cool and sometimes be frozen by the cold of winter. Generally lofts were not insulated as they are today, and freezers were unheard of in the home. 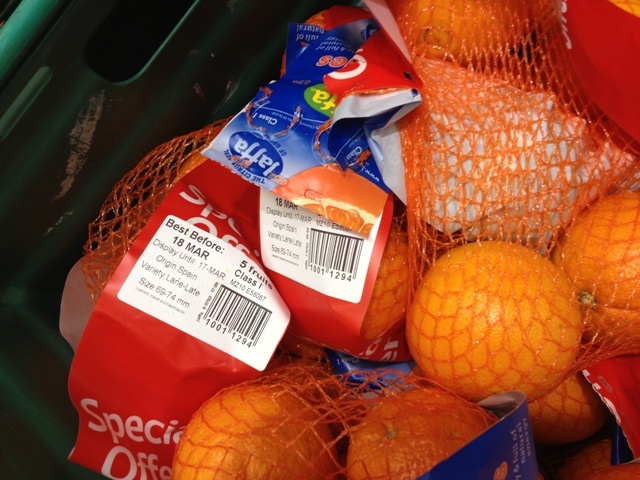 At Christmas there was the exception of being able to buy oranges that were shipped from Spain. Bananas were not readily available, especially in the mid 40s when Jamaican bananas were decimated by Panama disease. 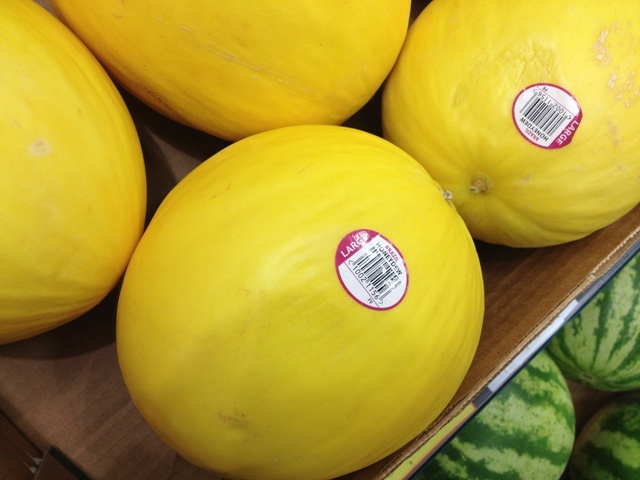 Today, we have a choice: Do we buy and eat fruit that has been imported from far away countries, or do we accept that we can do without our ‘five-a-day’? We could, of course, take vitamin tablets instead, but they may not be as nutritious or health-giving as fresh fruit. A high proportion of the latter is composed of fibre, which we are told is good for digestion. However, in this respect, are we being duped into thinking ‘five-a-day’ is the ONLY health-promoting way of eating? How about looking at Zoe Harcombe’s article in the Mail Online** which says there is a better diet for more healthy living?